You many know periodontal disease by its common name, gum disease. This oral health condition is also called gingivitis and periodontitis. Gingivitis being the mild form and periodontitis referring to the more advanced stage of gum disease. By any name, periodontal disease is definitely not sweet. In fact, studies indicate that as much as 80% of people over the age of 35 have some form of gum disease, which is the leading cause of tooth loss for this same demographic. Knowing the warning signs and risk factors for the disease and partnering with a dentist to create a preventive dentistry plan can save you from unnecessary damage to your smile and overall health. You can watch our informative video or keep reading to find out more about this chronic oral health condition. The word periodontal is actually a combination of two words. “Perio” means around and “odont” means tooth. That means periodontal disease is an oral health condition that affects the supportive gum and bone tissues around the tooth. It’s especially important that patients at a high risk for periodontal disease contact a dentist, if they notice warning signs of this disease. Patients with diabetes or other immune suppressing illnesses, expectant mothers, and those who smoke are among the most likely to develop periodontal disease. 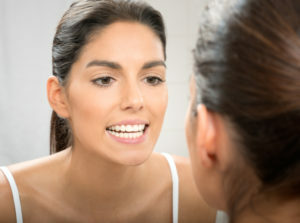 Dentists will work hard to help patients prevent this insidious disease with regular dental checkups and thorough at-home hygiene because it can be difficult to completely renew oral health once patients are suffering from gum disease. More frequent professional deep cleanings, scaling and root planing, and antibiotic therapy can all be used to renew oral health. At Joe Issacson Dental, our caring Oklahoma City dentist and team are dedicated to helping patients achieve and maintain their healthiest smiles. That includes screening for periodontal therapy during every six month dental checkup, providing recommendations to improve at-home hygiene, and partnering with patients to create a personalized oral health care plan that meets all of their needs. If you’re concerned you may be suffering from gum disease, it’s time to call our Oklahoma City dental team. We’ll answer any questions you may have and schedule an appointment to examine your smile and help you achieve and maintain the optimal level of oral health. If you’re interested in finding out more about the services we offer, come back to read our blog. We’ll offer information to help you understand your oral health and the services we provide.